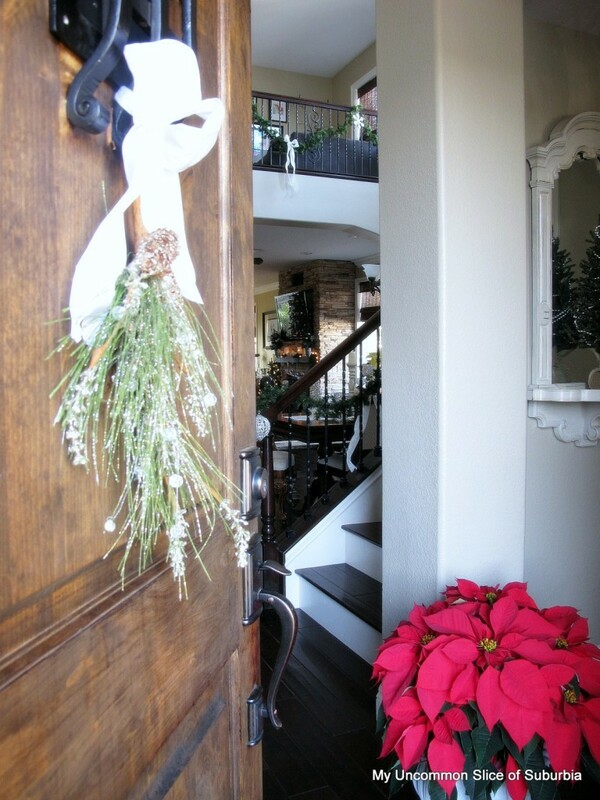 Welcome To Kristin Salazar’s Holiday Home Tour! We are halfway through the week! 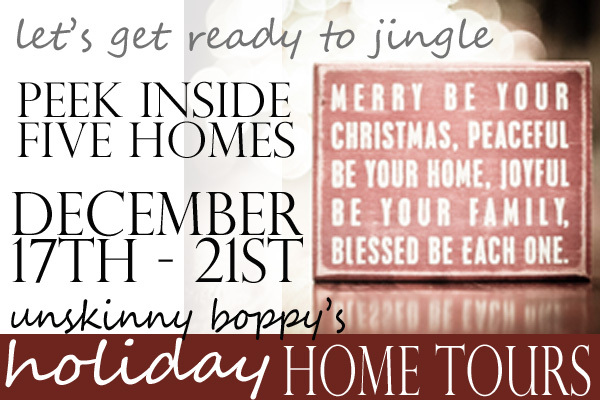 I hope you are so enjoying all of these beautiful holiday home tours from these talented bloggers. Today I’ve got such a special home to show you. I’ve been a huge fan of My Uncommon Slice of Suburbia’s blog for many years now, and I’m just overjoyed to introduce Kristin to you and feature her home on my blog. 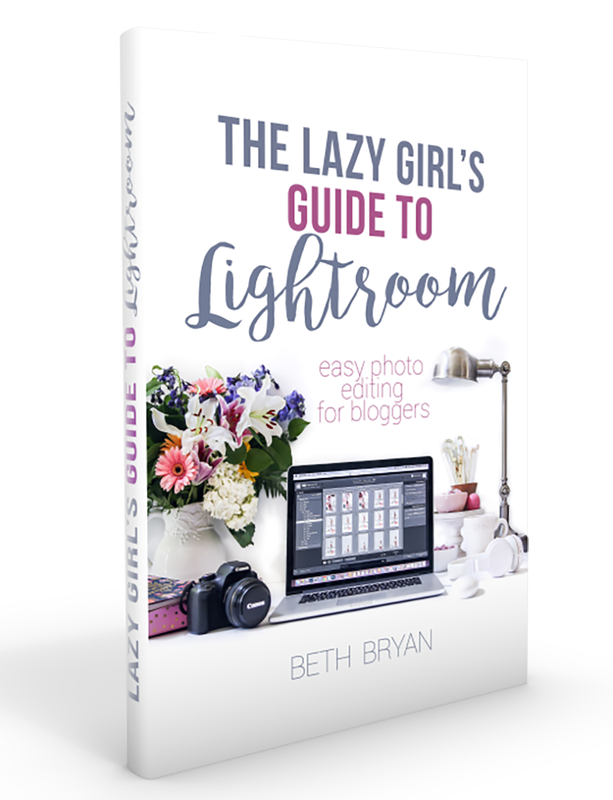 Every time I visit her blog I feel like I’m cracking open a big, thick, glossy Pottery Barn catalog and ogling all the goodies inside. Please tell me I’m not the only one who does that? I’ve said for years that Kristin has my MOST favorite fireplace in all of blogland, and so far that still rings true. That rock just calls my name every time I see it. Just wait til you see it all decorated for Christmas! I’m Kristin from My Uncommon Slice of Suburbia. 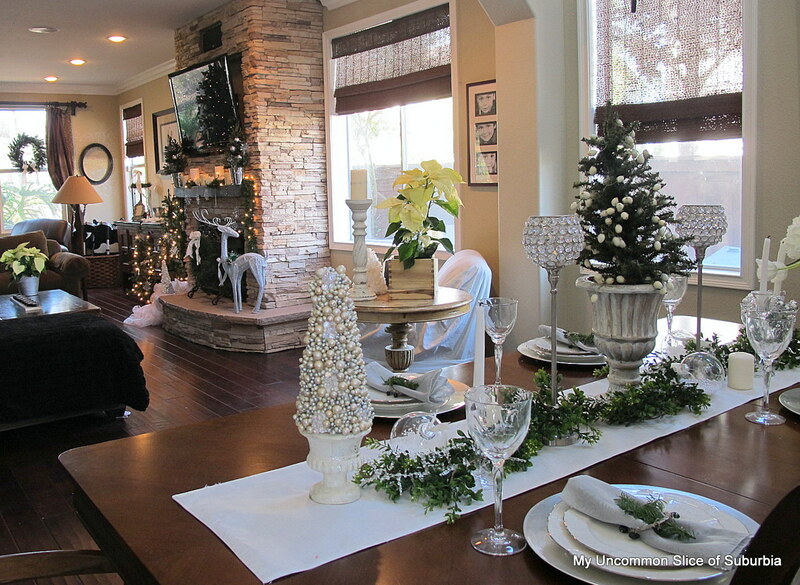 I am absolutely thrilled to be part of Beth’s Christmas House Tour. Beth has such a huge heart and I am honored to be here today! Christmas is one of my favorite holidays and I absolutely love decorating the house with the family, I hope you enjoy the tour! On our family nights we have enjoyed playing board games and watching movies with the fire on and the lights twinkling. I have had a ton of fun making beaded Christmas trees and ornaments this year with my family and friends. I decided on a very neutral color pallet with pops of silver throughout the whole house this year. 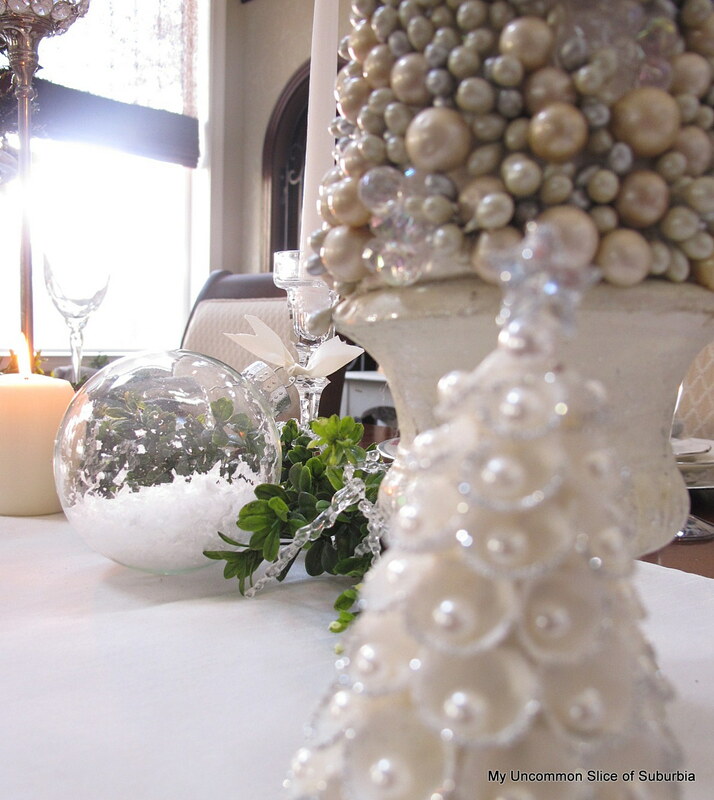 I filled the ornaments on the table with faux snow and pearls and stenciled a few with paint. 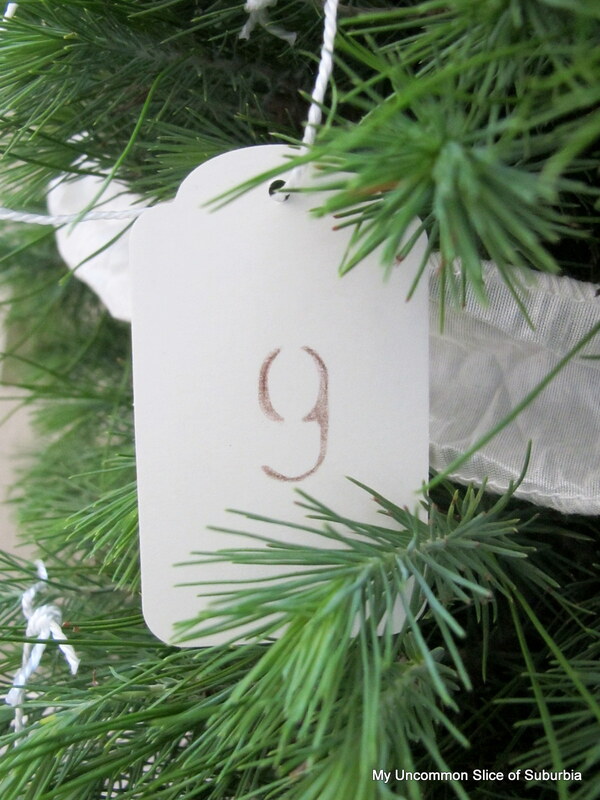 We also added a live tree on the stair landing which is our advent tree. The boys are thoroughly enjoying picking an activity each day when they wake. Thank you so much Beth for having me! May your holiday’s be blessed this year. Ok, guys… that fireplace? I want it in my house RIGHT NOW. 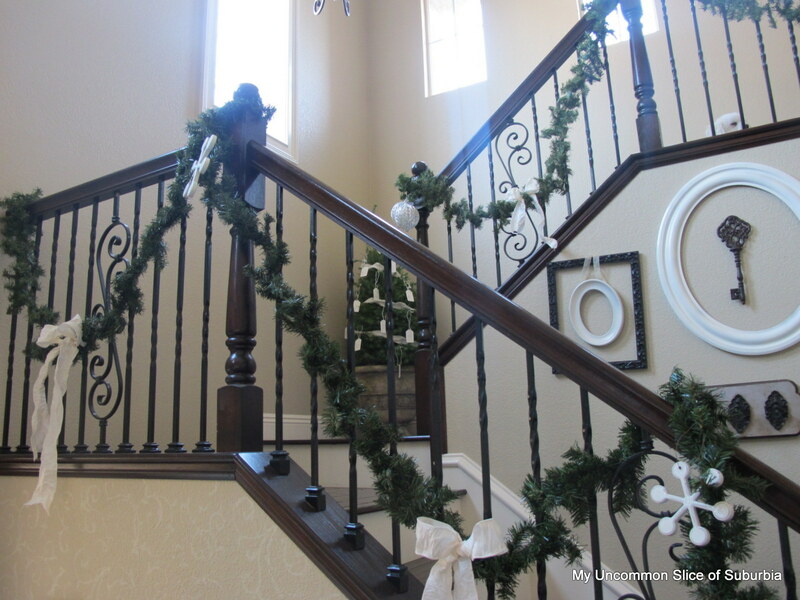 Did you notice that hoop-top wrought iron door under her staircase? I swoon. Don’t you just love Kristin’s home? I’m such a huge fan of her style and have been for many years. Thank you SO much for sharing your home with us Kristin! If you see any photos you’d like to pin, please consider clicking over to Kristin’s blog and link to the original source. If you loved touring Kristin’s beautiful home please leave her a comment here.In case you want to visit all the previous homes on the Holiday Home Tour this week, please click over to check them out! I promise you will NOT be disappointed. and Roeshel from The DIY Showoff! Thank you so much to all of these ladies for allowing my readers into their homes this past week. 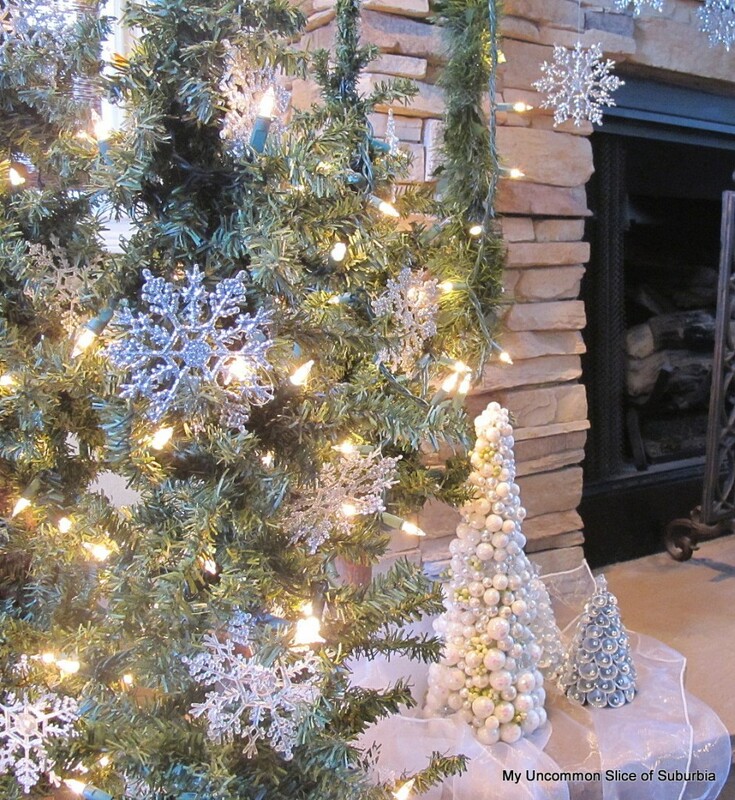 Love the ornaments on her tree, that big reindeer by the GORGEOUS fireplace … I LOVE her style!! 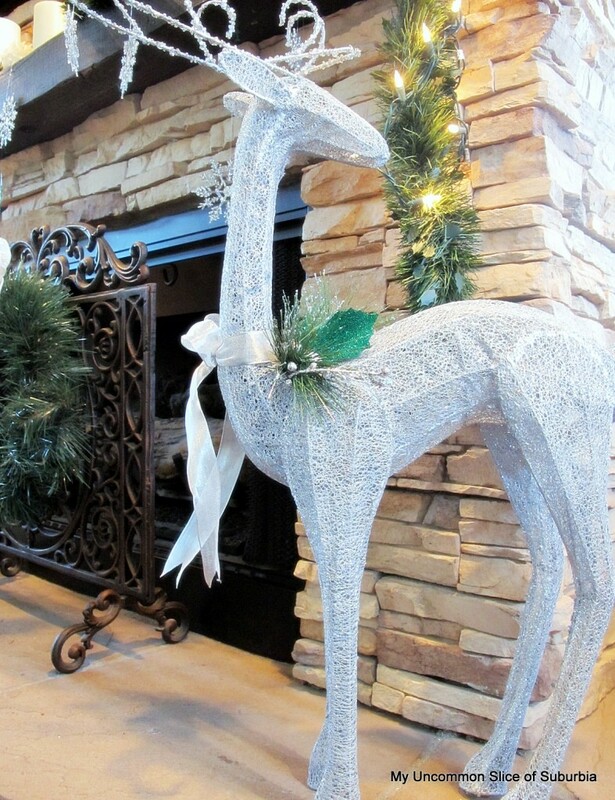 Just beautiful and very well put together, I love the silver decorations against the greenery – a gorgeous combination! I am drooling over that fireplace, just stunning!!! You are so kind to have me, thank you so much! Love being part of this awesome tour and getting to know you this past year. Just gorgeous! I love the silver/white decor! Thanks for sharing with us! Kristin…..beautiful home and decorating! 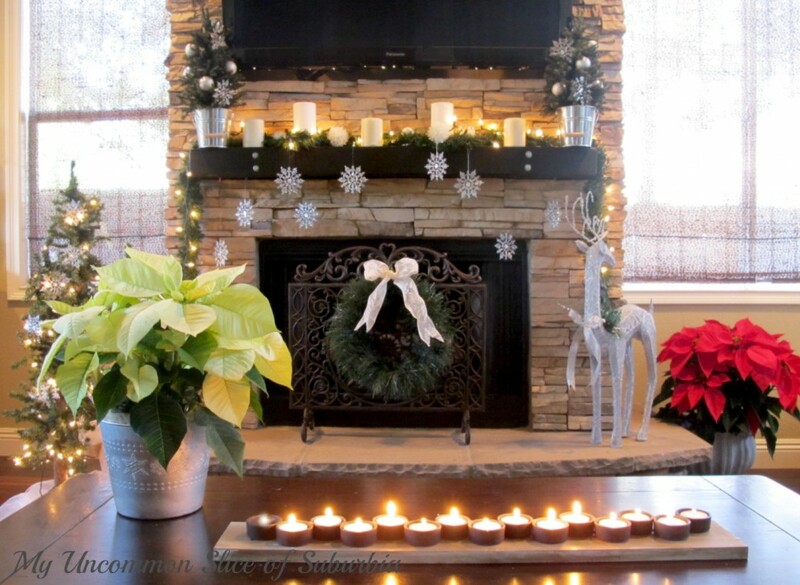 Absolutely LOVED your fireplace…..you must have been working for months!!! Just gorgeous! Beautiful! Just dreamy! Can I rent a room? 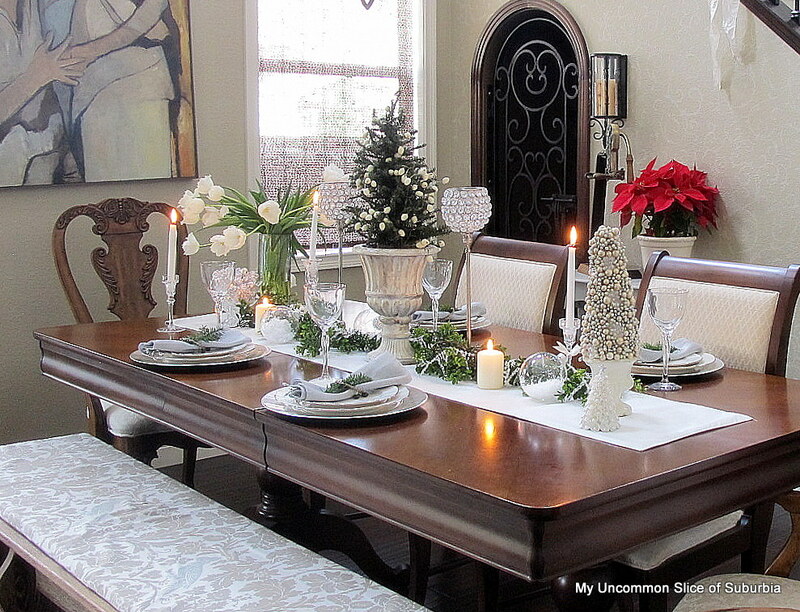 I’ve admired Kristin’s home for quite a while, her holiday decor is simply stunning!! Such a cozy beautiful home, perfectly decorated for the holidays! I’m in love with her stacked stone fireplace! A gorgeous home, beautifully decorated. 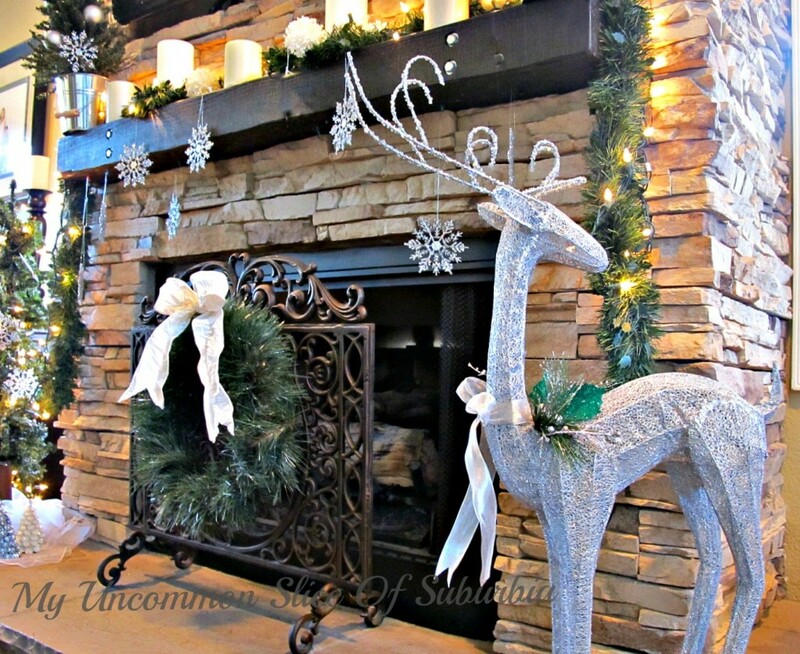 I LOVE that fireplace and the handmade decorations are delightful! Wow just amazing. What can I say it is just gorgeous! Love it. I can see why you love her fireplace so much…wow! 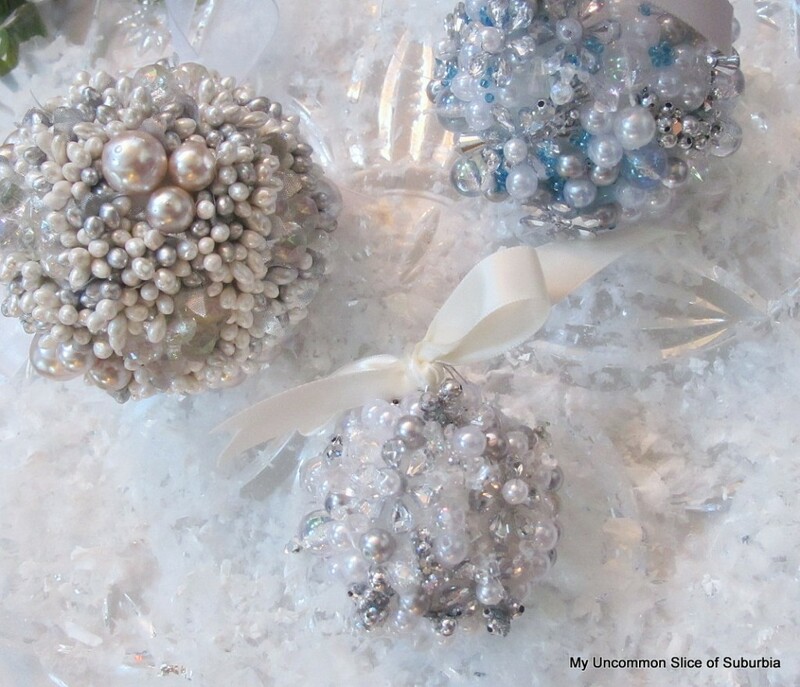 Those beaded ornaments are to die for!!! Just gorgeous! Thanks for sharing, Kristin! Oh Kristin, your home is beautiful! And Beth – I completely agree – that fireplace is positively swoon-worthy! Thank you both for a very inspirational tour!!! So pretty! Yes, the fireplace is especially beautiful! I love the combination of glamour and rustic! 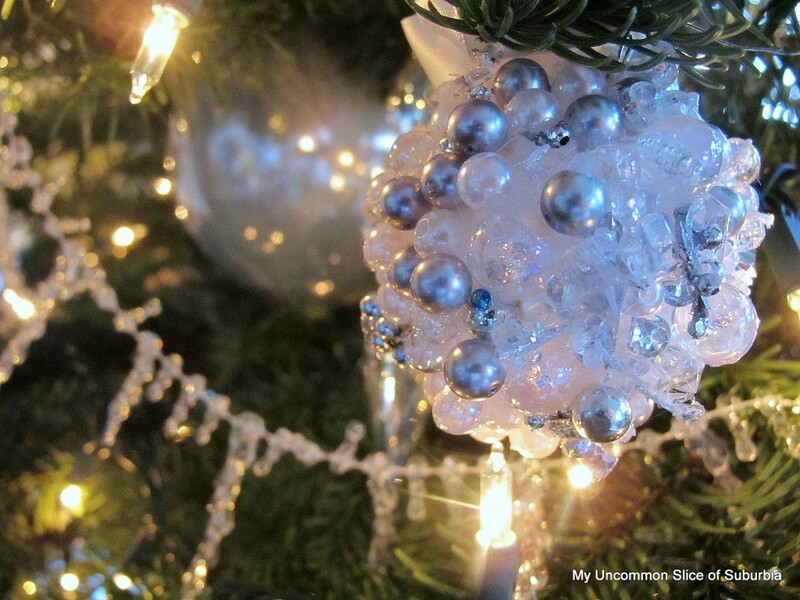 Gorgeous home Kristin, love the beautiful ornaments too!